Each Invitation contains a link and unique token to deliver the recipient to the desired page, logged in and ready to participate and/or with their contact info pre-populating the form. In order to take full advantage of the new invitations, you'll want to upload your potential supporters to your event site. As always, returning users can migrate donors and users from previous event sites. And everyone can now import new users and donors directly from spreadsheets. Some invitations have requirements that limit where they can be sent from. For instance, the Invitation to check-in can only be sent to ticketholders, so must be sent from the Tickets page and the Invitation to Check Out can only be sent to users with orders, so must be sent from the Orders or Auction Night pages. All subscribers can edit Invitation templates at Admin > Site Settings > Communications > Email Templates. Plus and Premium subscribers can also edit templates from the datapages as they prepare to send them. Resetting the password on any account will immediately invalidate all existing invitations to that user. Invitations do NOT provide access to a user's vaulted credit card information. Vaulted card information is masked (************1234) and is not stored within the software. Invitations to become a team member: (Chair, Admin, Volunteer/Staff): You no longer need to create accounts for your team. Simply send the invitation for the desired role. When they accept the invitation, they will land on a form to provide/confirm their contact info, select their own password and their user record will be assigned the appropriate permissions. Invitation to Donate Items: You can email your pitch to potential donors. The invitation provides a link to the online donation form with the donor's information pre-populating the contact information fields. Invitation to Provide Guest Info: This invitation is invaluable for asking ticket buyers to provide their guest information on unassigned tickets. Provides the ticket buyer with a link to guest forms for each ticket purchased. You also have the option to include this invitation link in the ticket sale confirmation email to provide easy access for updates. Invitation to Buy Tickets: Invite potential guests on your Users page to buy tickets. 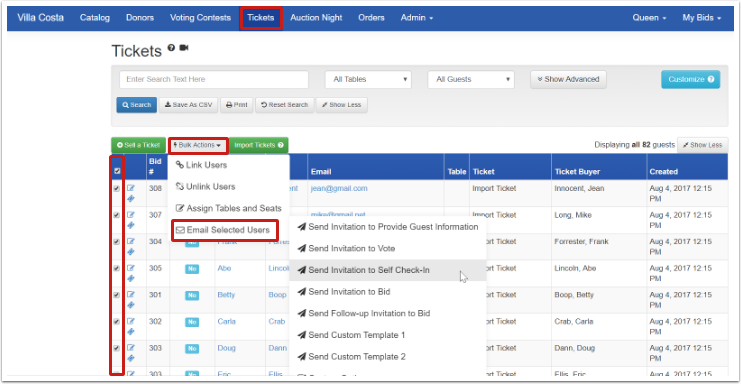 The invitation provides a link to the online ticket sales menu, creates an account automatically and autofills their contact information into the buyer's fields. Invitation to Check In: Provides a link to the check-in form which allows users to confirm/provide their contact information and vault a credit card (or change an existing vaulted card). Invitations to Bid: Invite supporters on your Users or Tickets page to bid. The invitation link automatically creates an account for them (if they don't already have one) and brings them to the screen ready to bid. Multiple templates are provided to allow you to craft and retain different text for different uses (initial invitation, follow-up invitation, automatic invitation). Invitation to Vote: Invite supporters on your Users or Tickets page to vote. The invitation link automatically creates an account for them (if they don't already have one) and brings them to the screen ready to vote. Invitation to Check Out: Provides a link to their shopping cart (and account) so they can review and pay for their order(s) online. Invitations to Give/Order/Pledge on the Donate Now Page: Different templates are provided with text tailored for each use, but each provides a link to the Donate Now page with the user's information pre-populating the buyer information fields.